The Flame Gourami is a captive bred colour morph of the popular Dwarf Gourami, Colisa Lalia. It is known under several different names, including Flame Gourami, Flame Dwarf Gourami, Red Fire Gourami, Blood Red Dwarf Gourami, Neon Red Dwarf Gourami, and Blushing Gourami. Just like the Dwarf Gourami, it is a member of the family Osphronemidae in the subfamily Luciocephalinae. Just like its many names implies, the Flame Gourami is a vibrantly coloured gourami and features a bold red coloration with blue parts. It is a truly striking aquarium fish and it has rapidly grown highly popular among aquarists. Unlike the normal Dwarf Gourami, the Flame Gourami is without any vertical striping on the body and fins and is decorated with a solid red colour on most of its body. This showy red shade contrasts nicely against the brilliant blue dorsal fin. The male fish is much more colourful than its female counterpart and sports a pointed dorsal pennant. The female fish normally has a bigger belly than the male and is not gaudily coloured in any way. The body of the Flame Gourami is slightly compressed and features comparatively large, rounded fins. The ventral fins look like threads and are very delicate. The Flame Gourami does not require a big aquarium since it is hardy and rarely exceeds 2 to 2 ½ inches (5 to 6 centimetres) in length. The males will usually grow somewhat bigger than the females. The Flame Gourami is a timid fish that will work well in a community aquarium with other peaceful species of roughly the same size. They are known to be somewhat shy and should never be kept with bullying fish. When you move your Flame Gouramis to a new aquarium they will normally be very bashful to begin with, but if you provide them with a well decorated aquarium with plenty of plant cover and no bullies they will eventually come out of hiding. They swim in all areas, but are chiefly found in the middle and top portion of the aquarium. Pairs can be seen swimming together. Begin a captive bred colour-morph, the Flame Gourami is without any native home in the wild. Its ancestor, the ordinarily coloured Dwarf Gourami, hails from the tropical Far East where it is found in paddy fields and waterways in India, Bengal, Assam, Bangladesh and Borneo. Its native habitat is densely grown and both Dwarf Gouramis and Flame Gouramis will appreciate aquariums with a lot of plants and hiding spots. As mentioned above, Flame Gouramis need a well decorated aquarium with plenty of hiding spots. A well lighted aquarium is fine as long as you include a lot of plants for the fish to seek shelter among. Ideally combine anchored plants with plenty of floating ones. The recommended water temperature for Flame Gouramis is 75-82° F (24 -28° C) and the pH-value can be from pH 6.0 to pH 8.0 (avoid any sudden changes). The water hardiness should ideally be within the 5-19 dH range. Just like the other gouramis, the Flame Gourami is equipped with a labyrinth organ that allows it to breathe oxygen directly from the air above the surface. This adaptation makes it possible for the gouramis to survive even in waters where the oxygen content is really low. This does not mean that you can skimp on water changes; regular water changes are still necessary to remove waste products from the water. Changing 25% of the water each week is a good rule of thumb. The Flame Gourami is an omnivore species that needs a varied diet to thrive. 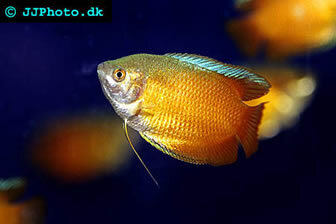 It is not a picky eater in the aquarium and will normally eat anything from flakes and pellets to live and fresh foods. You can for instance use high quality flakes or pellets for omnivores as a base and supplement it with occasional servings of live foods such as brine shrimp, white worms and blood worms. Flame Gouramis are also fond of blanched vegetables and vegetable tablets. Just like most other gouramis, the Flame Gourami is a nest builder. Since it is a colour-morph of the Dwarf Gourami, it will weave in bits of plants, leaves, twigs, roots, peat fibres and other types of debris in its nest. When the eggs have been laid, they will float around at the top of the bubble nest since they are lighter than water. They fry will also stay inside the protective bubble nest until they grow big enough to survive outside.